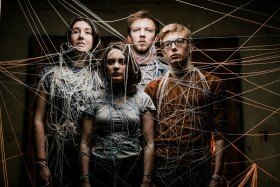 Much praise for four incredibly inventive performers who’ve put together A Pint Sized Conversation, an artistic work that deals with mental health and what to do when someone we love is suffering from the constraining effects of mental illness. A Pint Sized Conversation is such a multi-faceted, ingenious piece of theatre, it is difficult to know where the accolades begin, but from the moment I saw the set, which was a criss-cross of corded-string and clothes pegs strung up over the audience’s heads I knew I was in for a treat. Yes, think of an old-fashioned washing line from which hangs – not clothes – but bags of various flavoured crisps and you can sense the intelligence behind the use of off-beat visuals to drive forward a narrative on depression and mental health. Before the play begins, the four-member cast, Dylan Frankland, Rosa Day-Jones, Tobias Grace and Katherine Lea pull the bags of crisps from the washing line and distribute them to the audience, leaving the line completely bare, and then swing into action. Each actor’s voice rises in a rapid, staccato-like chorus as they shout the debilitating aspects of depression, while at the same time hanging a one-word sign on the now empty washing line as a visual effect. So what we see hung out to dry are the words: sadness, isolation, loneliness, tiredness, struggle, and most frightening, suicide. Each actor also relates a personal account of a significant other in his or her life who suffers with depression. And with honesty, the actors talk about their frustration, anger and feelings of helplessness in not always getting it right when offering support to someone who is experiencing severe difficulties with the minutiae of daily life, whether that person is a lover, sister, stepfather or friend. Ethics also plays a part as each actor lets the audience know that they’ve gained permission from their significant other before discussing their experience in a public space. Of particular poignancy was Dylan Frankland’s searing narrative of a conflicted relationship with a family member who he deeply loves but, at times, deeply resents. As he spoke he also lived the experience, one that any member of the audience could recognise as having felt in themselves or, possibly, having caused in another person. And then, like a mood change, the set would morph into a planetarium with illuminations, as in the case of Rosa’s Brain, an informative piece that demonstrates how the brain functions in relation to depression. For instance, I learned that the brain treats rejection like physical pain. It makes a lot of sense because we feel the equivalent of ‘Ouch’ when someone we love rejects us. This powerhouse quartet of actors also use mime and, at times, strenuous physical theatre to emphasise the psychic chaos that affects people with mental illness. It’s one of the most informative, effective and inventive pieces of theatre I’ve ever seen and if you’re lucky you’ll be able to catch it in various pub venues throughout 2018. A theatre piece about depression made by those with close family & friends who suffer from it. Personal stories are placed front & centre; disrupting the quiet, hushed, stigma surrounding mental health. Making it loud, messy & sometimes ugly. Performed in a pub we utilise this intimate setting to directly engage an audience without the conventions imposed by traditional theatre venues. Endorsed by Sarah Knight of RETHINK MENTAL ILLNESS charity who described it as ‘Powerful and enlightening’, this uplifting, moving and often humorous performance forges a communal & deeply personal space in order to grapple with the question: How does a community cope with depression & shatter the stigmas surrounding it? I saw this performance in Cheltenham, and I agree with Loretta Monaco, you live the performance, and can relate to many parts, the four performers told their stories so movingly, and when Rosa sang it was sad but beautiful. Congratulations to them all. If you can catch a performance please go along you won’t be disappointed.